When you have kids, you want to ensure they spend sufficient time outdoors to exercise and expend surplus energy. Your backyard can turn into a thrilling and fun adventure for your kids if you incorporate the right elements. Of course, you can do this without disturbing your flowerbeds or landscaping. There are simple and affordable ways to make your backyard kid-friendly. Plant tall grasses and weeping trees in one corner of your backyard. Lay stepping stones to create a winding pathway through this “jungle” where kids can let their imagination run wild. You can even plant giant sunflowers and place a large boulder for your kids to climb on. This inviting and fun jungle will definitely get your kids outdoors, away from their computers and TVs. This can also create some hiding spots for dangerous critters so you keep the grass short and the plants to a minimum. Screw a large outdoor chalkboard to your fence and you are done. That way, you can easily let the kids use the chalkboard to scribble and draw. If you’ve ever tried to remove chalk from cedar fencing, you know it can be a pain. This way, your fence will not be sullied with their artwork and the kids will still have a place to get their creativity out. It can be fun to recreate the beach in your backyard. Instead of going for the ubiquitous sandpit, dig a shallow undulating pit in your backyard. Cover it with landscaping plastic and then fill it with sand. Even out the sand and in the middle place bricks to make a bonfire in the evenings. It will be a place for the kids to roast their marshmallows in the evening while you sit on your bench and sip a glass of wine or some iced tea. Kids are fascinated with those colorful butterflies, bees, squirrels and birds. They can spend hours looking at them and laughing at their antics. So, make your garden creature-friendly by planting colorful flowers and hanging a birdfeed to a tree branch. You can easily use a terracotta flat-bottomed container and use jute ropes to hang it securely to a branch to create a homemade birdfeed. Then watch your kids improve their power of observation! After all the running around, exploration and playing, kids need a shaded area to catch their breath, sip a cool glass of lemonade and get their energy back. You can easily install a gazebo. No, you don’t have to spend a lot of money. Just press the button for a DIY gazebo kit. It is affordable and comes with precut pieces that you can join to erect the most beautiful cedar gazebo. If you like, you can even go in for a three-season or all-season DIY gazebo kit. This way, the gazebo can be used by your kids and you even when the weather outdoors is cold. Place outdoor comfortable outdoor furniture in the gazebo and a few potted plants and you will have a wonderful sanctuary to rest and rejuvenate. Music can make you feel happy and also let you be creative. Encourage this in your kids by creating a music wall in your backyard. Use a portion of your fence and fix pots, pans, xylophone, and wind chimes that kids can use to make sweet (and sometimes not so sweet) music. All parents know what an ordeal it is to get kids to eat their vegetables. But this could be a thing of the past if you teach your kids to grow their own vegetables. Designate a patch in the garden for your kids to grow the veggies they like. Help them with the sowing, caring, and watering and watch the delight on their faces when they see first veggie appearing. Pick easy vegetables that require minimal care and maintenance and also ones that grow quickly. Forget those expensive splash pads that you get in stores. You can create your own for a fraction of the price. Lay out a tarpaulin in the middle of your backyard and wet it with the garden sprinkler and your splash pad is ready. Just be around to supervise the kids, so that they don’t fall and hurt themselves. If you have kids, you definitely need to have a swing in your backyard. Use an old car tire to make a swing. It will upcycle the tire and also serve the purpose. Alternatively, you can saw off the legs of an old chair and use it to create a swing with armrests and backrest. Paint the chair in colorful oil paint to make it attractive and vibrant. Just make sure the swing is securely tied to tree branch and is sturdy enough to take the weight of your kids. 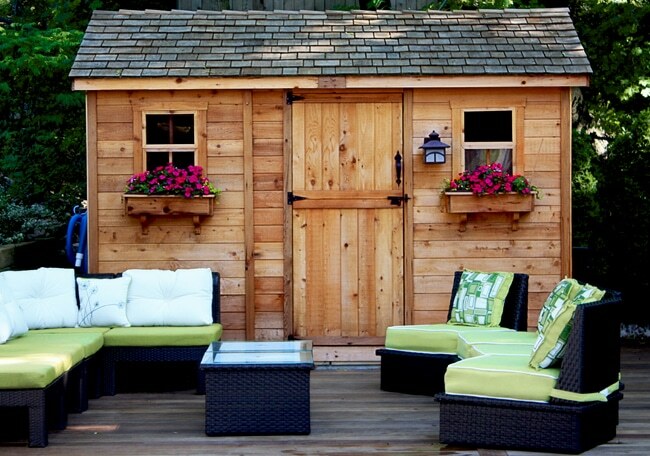 These are some ways to make your backyard kid-friendly and these ideas quite inexpensive. So, even if you are on a tight budget, you can still get your kids moving and being physically active regardless of the weather outdoors. And off those machines!